Such a happy book hunt! I'm currently translating Philip Reeve's Mortal Engines for the readers in my country before Peter Jackson's movie comes out in December! A fine find indeed. They sure are massive books indeed. You can never go wrong with a good book. That bag is so funny. I'm currently reading "Violated", a true life story of abuse. I never read fiction. 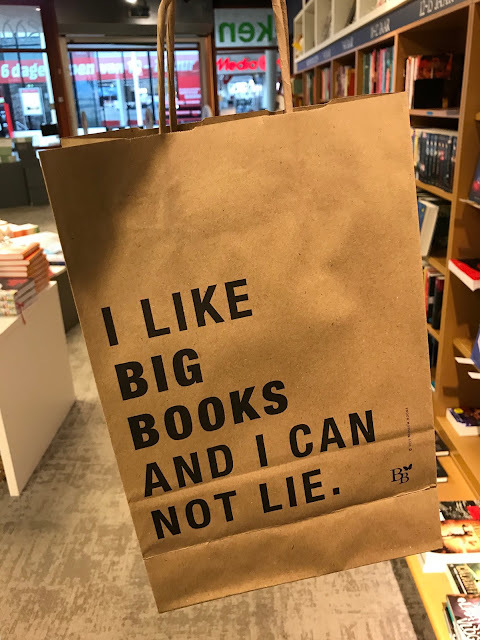 That's a cool bag! need a lot of books to full it! That bag is so cute + funny! Sharon, that was the perfect solution! Glad you got all the books in ONE! Yes, that bag mad me giggle! A keeper. what an awesome bag. i love hipster things like that. Bem divertida a sacola! hahaha!